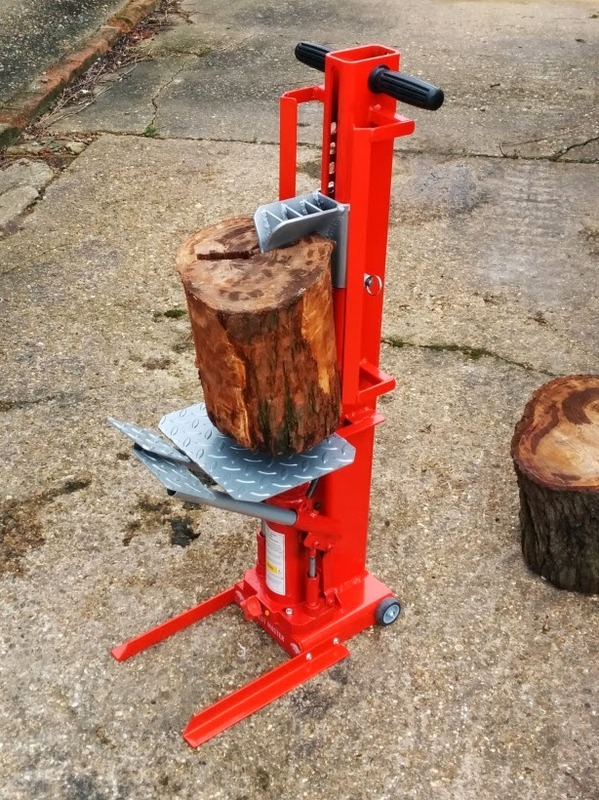 I have just received the Duocut 10 Ton Manual Log Splitter by Forrest Master. Having assembled it and used it a few times, I decided it was worth writing a review. I'll come back to the assembly so that I can start off with something positive. I purchased it from Arrow UK who had no hesitation in arranging a Saturday morning delivery for me. It turned up before 10am which was ideal. It splits logs very easily. I bought it because I was having trouble splitting some Elm that had recently been felled along the edge of one of our fields. The Elm was in a dangerous way because of the high winds we had over the Christmas period. Sadly quite a lot had to come down so I have a large pile to split. I tried to split them with a splitting wedge and with a drop hammer type splitter, the type sometimes referred to as a Swedish splitter. Both of those methods have split everything else I have tried, including some equal and larger size Willow. Neither made even the slightest impact on the sections of Elm trunk! Luckily a friend and neighbour had an 8 ton manual splitter that he had recently purchased. We tried one of the logs on that and with some effort it split it but at risk of breaking the splitter. I therefore decided I needed something a fraction more powerful. 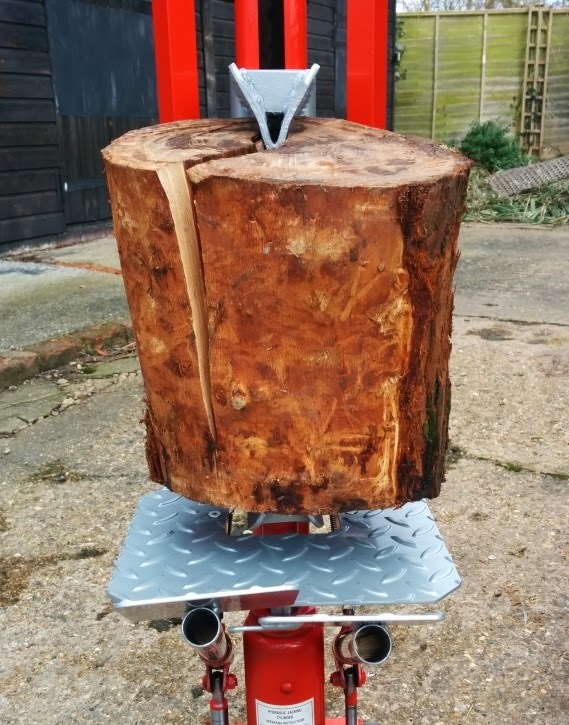 I liked the look of the Duocut, with it's top and bottom blade arrangement and quite a large base plate to sit the logs on. That's what arrived today. I put the first log on, sat the top blade just on top of the log, a couple of short pumps and it gripped the log and just a couple more easy pumps and the log split with hardly any effort. I was very impressed immediately. The Elm is still tricky but so far every log, no matter what diameter, has split. I guess I've gone up to odd shaped 40cm (16") diameter logs, so far. All cut to a bit over a foot (30cm) long, as shown in the photos. The only thing causing a problem is how entwined the grain of the Elm is, so that even though there is a full split from top to bottom, it still pulls back together. I'm not worried about that, now it has split I can finish it off with an axe or even a bolster, just to break the last bit. It's not all good news though! The tolerances of the manufacture are awful! There were a couple of bits that did not line up and needed some work to get together. No tools are supplied. I don't mind this and I am sure any free tools supplied would not have been up to the job. I have a good set of tools. A reasonably good quality socket set, including socket mounted Allen (hex) keys which were a big help plus I have some very good quality hand held Allen keys. I needed, 10mm and 13mm sockets, 10 and 13mm open ended spanners, 4, 5, and 6mm Allen keys and the oddest requirement was the sash clamp (or bar clamp would have done)! Just to be clear, the sash clamp is not part of the official assembly instructions! The instructions are fairly clear except that the list of components is misleading. The two bolts that hold the foot pedals in to the bottle jack were already in the bottle jack but I was not to know that, so I thought I was two bolts short. I also had two different types of 40mm bolt but they are not identified separately in the list. Their significance became obvious when I was bolting down the bottle jack. Anyway, as it turned out everything was present. The manual is full of safety warnings, which I did read and eventually you get to some pictures followed by the instructions. These are clear and for the most part putting it together is straight forwards but there are some changes to the design, not included in the instructions. The instructions claim a transit bolt for the lower axe blade, that was not present on my splitter, there was no hole for the transit bolt so it must have been completely omitted from the design. The bottle jack came with it's release valve assembled but the instructions assumed a transit plug needed to be removed, which it did not. Now for the bad bit. One of the bottle jack mounting holes is so close to the rear pivot that the rear bolt will not drop in to place as intended. This is where the two different types of 40mm long bolts is significant. 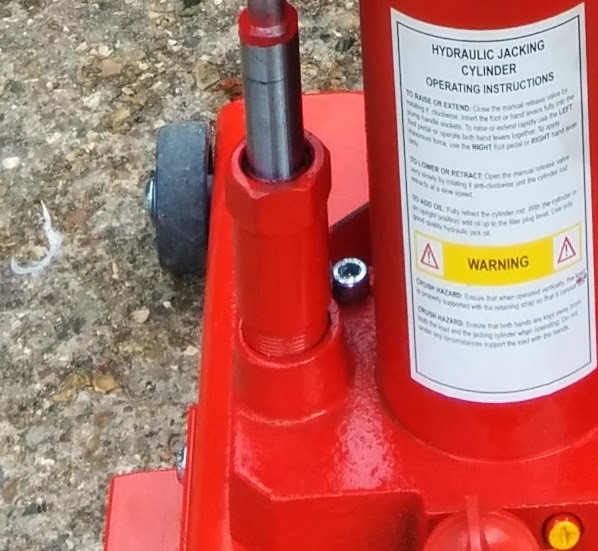 The ones used for the wheels have a larger diameter head and would stand no chance of fitting in the gap at the rear of the bottle jack. The other two bolts have narrower but taller heads but still do not fit properly. I tried to hammer it in but could not get a hammer in with enough force. Eventually I managed to get enough thread through that I could get the nut on and used brute force with the socket to pull the bolt down in to place. It was not easy and I did not like putting that much pressure on the bolt head. I also got the Allen key stuck and it took some bashing to get that back out. It's in and secure and there is no reason to ever need to remove it. The last troublesome bit was fitting the plate that the log sits on. I have a Land Rover, so I am used to poor tolerance and bolt holes in large chunks of metal not lining up, so getting this last bit together was fairly easy and did not need any of the drilling, usually associated with Land Rover parts! The arms that stick out, to mount the plate on to, were nowhere near where they needed to be to get the bolts in. This is where I used the sash clamp to pull the arms together so I could drop the bolts in and get the nut just on the end of each bolt. I then released the sash clamp and tightened up all the bolts. Not too tricky. Overall what should have been a 20 minute job took about an hour. It's all together, feels very strong and it's not too difficult to haul about to where the logs need splitting. The dual action is easy to use and the return springs are the right pressure for the job. Most importantly it splits the logs with no trouble. I just need a bit of nicer weather to get out and make my way through the mountain of tree trunk. Using the splitter yesterday the hydraulic jack got stuck and would not go all the way down. The wedge had not been going down to completely level with the platform for a while but this time it got stuck at about 2 inches up making it useless! I was all ready to send it back but as I had a pile of logs to do. I decided it was worth a fiddle. To cut to the conclusion, the central plunger of the jack can be twisted to get it to drop properly. I jacked it up so I could hold up the sprung wedge. I used a small crowbar pushed between the platform and the underside of the wedge. I wanted to make sure there was no chance the wedge could be pulled down while I was working on the plunger. I found that with some initial effort I could twist the shiny plunger from side to side to get it to drop. I also discovered that the plunger is tight when twisted all the way either clockwise or anti-clockwise but in the middle it drops properly. Since I adjusted the plunger it has worked perfectly. Hi John, are you still happy with this log splitter? I'm considering one. I am, yes. I've only tried a couple of similar products but I am glad I bought this one. Thanks John for your swift response; now ordered; will see how it copes with the felled (and sawn) trees I've just foraged!